The Business Breakfast Series is organised by Napier City Council and events are offered to the business community of Hawke’s Bay quarterly. We encourage businesses large and small to attend and to learn from the range of inspiring business leaders who speak and lead discussion on a variety of topics. 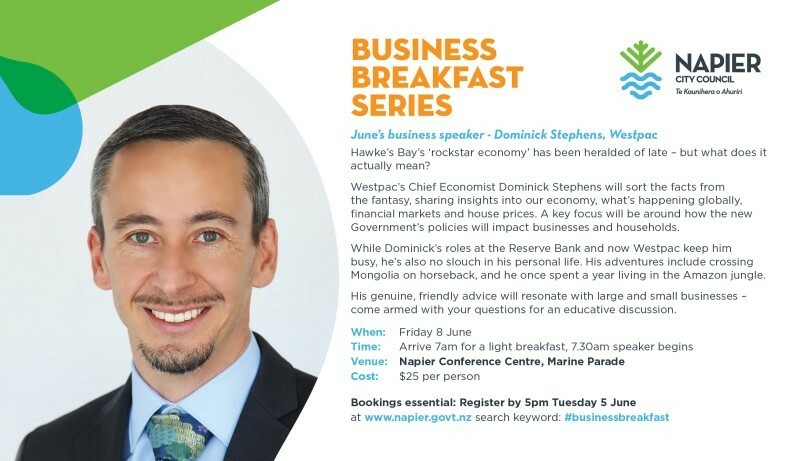 The next Business Breakfast will be held on Friday 8 June at the Napier Conference Centre and we look forward to welcoming Dominick Stephens from Westpac as our speaker. Hawke’s Bay’s ‘rockstar economy’ has been heralded of late – but what does it actually mean? Westpac’s Chief Economist Dominick Stephens will sort the facts from the fantasy, sharing insights into our economy, what’s happening globally, financial markets and house prices. A key focus will be around how the new Government’s policies will impact businesses and households. While Dominick’s roles at the Reserve Bank and now Westpac keep him busy, he’s also no slouch in his personal life. His adventures include crossing Mongolia on horseback, and he once spent a year living in the Amazon jungle. His genuine, friendly advice will resonate with large and small businesses – come armed with your questions for an educative discussion. Bookings are essential. Please register by Tuesday 5 June.